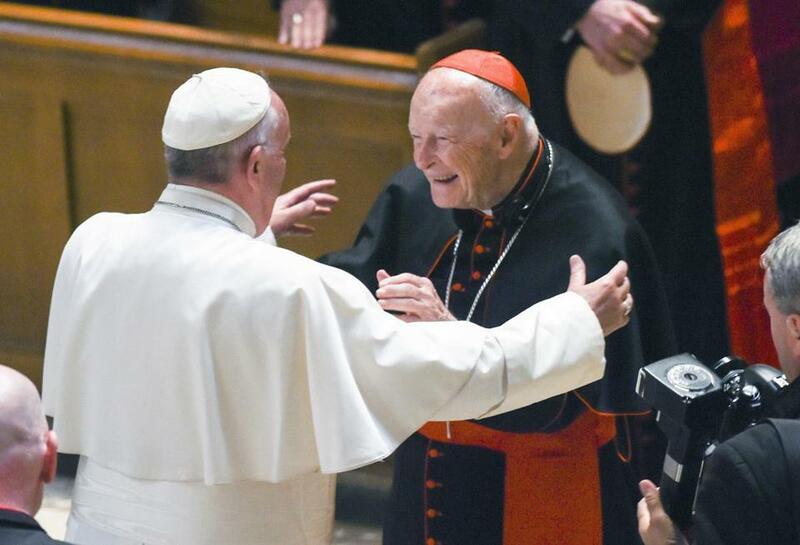 Pope Francis reaches out to hug US Cardinal Theodore Edgar McCarrick at the Cathedral of St. Matthew the Apostle in Washington, on Sept. 23, 2015. McCarrick resigned from the College of Cardinals in July. Walter V. Robinson is editor-at-large of the Globe. He led the Spotlight Team’s investigation that uncovered the Catholic Church sexual abuse scandal. Sixteen years later — too much later — it is now time for a full and final reckoning. In the wake of the Pennsylvania grand jury report, prosecutors in every state should finally find the backbone to force the church to tell the truth. The truth we can handle. It is the endless cover-up we must no longer abide. Until recently, few could have credibly argued — as some are now trying — that Pope Francis and his point man on the sexual abuse scandal, Cardinal Sean P. O’Malley, should resign. They were, after all, the two men in the Vatican who seemed committed to cauterizing the wounds from a scandal that spools endlessly along. But in light of recent allegations about how, or whether, they dealt with the serial sexual misdeeds of Cardinal Theodore E. McCarrick, their reputations, if not their jobs, are in jeopardy. Since 2002, when the scandal first broke open, attorneys general in just four states — Pennsylvania, New Hampshire, Maine, and Massachusetts — and a handful of local prosecutors have used subpoena power to force the church to turn over complete records of clerical crimes. In 46 states, there has been no full accounting: The cover-up continues uninterrupted. It now seems likely that the crimes of several thousand more priests remain hidden. wrenching. Pennsylvania Attorney General Josh Shapiro’s grand jury scraped clean the records from six dioceses. Its report found that 301 priests had been credibly accused of sexually molesting more than 1,000 children and that — no surprise — the dioceses, all using the same playbook, kept it hidden for decades. It was the bishops who enabled and sometimes facilitated the abuse. I have interviewed scores of survivors of clerical abuse over the years, but reading the horrific details of sexual assault in the report left me choked up. 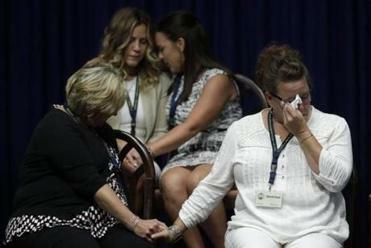 A grand jury report released Tuesday said church leaders in six Pennsylvanian dioceses protected more than 300 abusive priests. Read: Why don’t women have a role in the Catholic Church? Not so. In late 2002, when it was still politically risky to take on the church, Massachusetts Attorney General Thomas F. Reilly convened a grand jury to do his own investigation. In July, 2003, he reported that 237 priests in the Boston Archdiocese alone had sexually molested children. Before Reilly’s investigation, the Spotlight Team had already found evidence that at least 161 priests were culpable. Those 237 priests in Boston represent 10 percent of all the priests who served in the diocese. In the handful of cases where grand juries, like Shapiro’s and Reilly’s, have forced the church to cooperate, the resulting findings have dwarfed what the church had previously admitted. Consider the numbers. Reeling from the disclosures in 2002, the US Conference of Catholic Bishops encouraged all of the country’s 195 dioceses to report how many of its priests had been credibly accused. In the six Pennsylvania dioceses that were examined by Shapiro’s grand jury, the bishops in 2004 reported 143 priests. When Shapiro got the records, it turned out to be 301. Some of the difference — but not much — can be attributed to the small number of priests who have been accused since 2004. Most of the difference amounts to deliberate underreporting. In 2002 and 2003, when my Spotlight colleagues and I traveled to other states to speak about the revelations in Boston, the reaction we often got went something like this: Is there something in the water in Boston that made so many priests molest children? No, we’d say. It’s the same in your state — probably 10 percent of your priests too. It’s just that your cover-up continues. Terry McKiernan, who for 15 years now has tracked the abuse, nationally and worldwide, diocese by diocese, as president of BishopAccountability.org, said he believes that full investigations in every state will show that well over 10,000 priests abused children over several decades. That would be as many as 4,000 more than the church has acknowledged. For Catholics who want all the secrets exposed, McKiernan’s tiny nonprofit represents an investment opportunity with a guaranteed return. This month, O’Malley said that from now on, American bishops should turn over their records to civil authorities — “when asked.’’ Until now, asking has not worked very well. Only a demand that is delivered with a grand jury subpoena will get the records. The truth we can handle. It is the endless cover-up we must no longer abide. Which brings me to O’Malley and Pope Francis. That they might talk the talk but not walk the walk should also come as no surprise. On this issue, they’ve promised much but delivered little. More recently, Pope Francis has been all but tone deaf, most notably with his ham-handed statements about sexual abuse in Chile. Then there is the inexplicable treatment of McCarrick. Pre the #MeToo movement, McCarrick was a red-hatted Harvey Weinstein, sexually exploiting young seminarians and priests. It was, we now know, not exactly a secret among many of McCarrick’s peers. Yes, the accusation that Pope Francis knew about these forced trysts and did nothing comes from an embittered archbishop who — not alone — wants to bring down the pope. But what of the accusation itself? It strains credulity to believe Francis did not know. And he has not denied it. As for O’Malley, he claims he knew nothing about a 2015 letter his top aide received about McCarrick. Really? In 2002, some theologians declared the scandal to be the church’s most serious crisis since the Reformation. It has now morphed into a catastrophe with the potential to be far worse than that historic schism. In our lifetimes, there have been few cataclysmic moments when the gulf between good and evil has been so wide and so evident. And the evil resides solely in the top reaches of a church in which a billion or more of us were born, baptized, confirmed, and married. And taught to revere the sanctity of life. It is a betrayal of staggering dimensions. For many Catholics, it is no longer a question of whether the church can recover from this. The question is now more terrifying: Can the church as we know it survive intact? Walter V. Robinson can be reached at walter.robinson@globe.com.